Apple has overtaken Symbian over the past year to become the top smartphone platform in the UK with 27.1 percent market share, followed by Google’s Android with 26.7 percent market share and Symbian with 22.5 percent. In May 2011, 42 percent of UK mobile consumers used a smartphone compared to only 27 percent a year ago. Android has rapidly grown its user base adding nearly 4.7 million new users over the past year, equaling a 634 percent rise. In May 2011, Android was only 0.4 percentage points short of being level with the leading smartphone platform Apple. 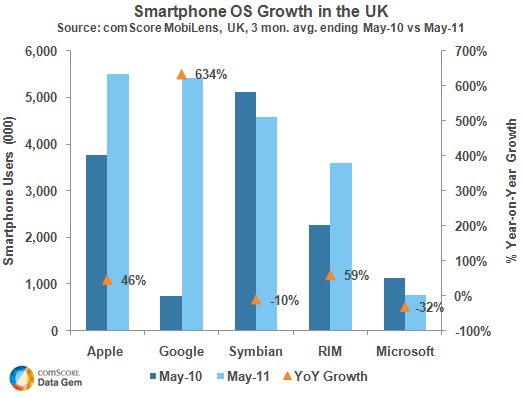 The Above data for UK, Mobile OS is provided by Statscounter , and shows the marketshare of the top 8 Mobile OS, is from from July 2010 to July 2011. .